Fellow writer Michael Panush has a new book, Hellfire! Hellfire, Texas is a strange town that needs a strange sheriff. Standing in the shadow of Silver Mesa, an otherworldly chunk of gleaming rock with strange properties, Hellfire is a magnet for trouble and danger. 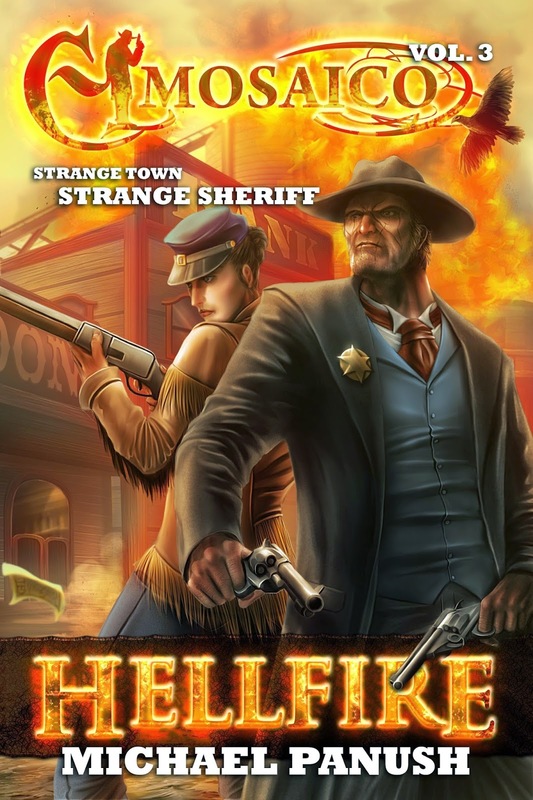 Clayton Cane–a patchwork man assembled from the bodies of dead soldiers and brought to life with dark magic–may be the perfect gunslinger to wear the town sheriff's badge. After years of working as the violent bounty hunter known as El Mosaico, Cane would like nothing more than to settle down and begin a new life as Hellfire’s stalwart peacekeeper. But, as Cane soon discovers, being a sheriff has its own challenges. He’s got to deal with caterwauling temperance marchers, an inquisitive newspaperman and Nelly Needles, his fiery, sharp-tongued new deputy. And something worse is coming to Hellfire–a foe more terrible than any outlaw or monster that Cane has battled in the past: industry, commerce and modernization. Powerful business tycoon Gaspar Noble wants Silver Mesa–and the town of Hellfire–for himself. Cane decides to stand against him, in a battle that may be more than Hellfire–and Clayton Cane–can possibly bear. If you scroll down you'll find a past interview with Michael as well information about other books he has available.